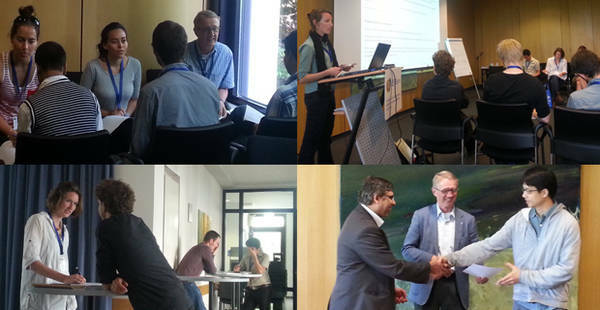 In May 2014 GWSP organized and hosted the first Summer Water Academy on “Communicating Science on the Water-Energy-Food Nexus” at the Center for Development Research in Bonn. 16 young scientists from seven different countries worked together over one week to improve their skills in communicating science to various audiences. Experts in the field of science communication from five institutions shared their experiences and insights. Academic advisors gave detailed feedback on participants’ research projects. The Academy started on Sunday, May 18th with an ice-breaker and an introduction into science communication. The day concluded with an informal dinner at the institute. The following two days participants and instructors attended the conference “Sustainability in the Water-Energy-Food Nexus”, during which participants were asked to take notes and report on one specific session as part of their training. These reports will be published in a special issue in the open access journal “Change and Adaptation in Socio Ecological Systems” to make the sessions’ content available to a large audience. The main block of the Summer Academy started on Wednesday, May 21st, when participants gave short presentations on their research to a mixed audience of academic advisors and communication professionals. The presentations were complemented by inputs from scientists and communicators who shared their expertise and personal experience in the fields of science and communication. The next day was shaped by blocks of individual work time with academic and communication instructors. Academic advisors provided detailed and personal feedback on participants’ research papers to improve the visibility of their studies in the academic world. Communication professionals worked individually with each participant to improve presentations and make them attractive to and understandable for a non-scientific audience. On the last day participants gave an improved version of their presentation followed by a final round of feedback by academic advisors and communication professionals. Additionally, each presentation was recorded to give participants the opportunity to see themselves from the other side. Months after the Summer Academy was completed participants are still in touch with some of the instructors and tell about successful presentations they gave based on the inputs and techniques learned during the academy. This has encouraged the IPO even more to conceptualize further activities for young researchers in 2015. These activities are envisioned to connect to the outcomes of the “Sustainability in the Water-Energy-Food Nexus” conference, one of which is the Call to Action (PDF, 5MB). In the Call to Action the organizers of the conference state that: “It is essential to greatly expand financial, technical and intellectual resources for nexus research and applications”. In this spirit the future activities will focus on supporting early career scientists in developing new nexus related research projects, facilitate networking activities with senior scientists and support proposal writing to establish new working groups.